Published June 12, 2018 By Leisa Good This post may contain affiliate links. Regardless, I only recommend sites I've researched and/or used and trust. Do you have a passion for teaching children? Do you relish the use of the English language? Do you enjoy making a difference in the lives of those children? Then keep reading, because you are about to be introduced to an online teaching platform/company called SayABC. 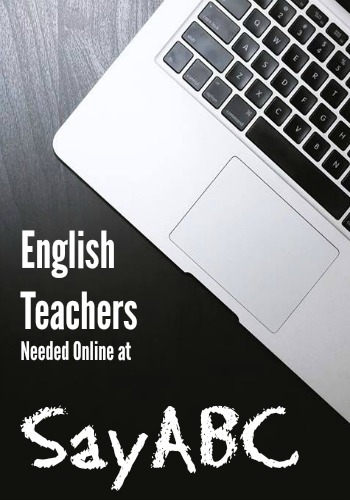 SayABC is an online ESL (English as a Second Language) platform that allows English teachers, who are also native speakers, to interact and teach English to Chinese children. These children are between the ages of 5 to 12 years old, which is the age that most experts agree the brain is more receptive to learning a new language. At SayABC, online teachers are hired as independent contractors who will be trained to use a 1 to 4 tier interactive classroom. The proprietary curriculum is provided and is designed to make learning English both fun and continuous. Should your application gain acceptance at SayABC, you will be using two main propriety programs known as Our World Readers and Our World to teach and interact with the students. Our World Readers was designed to be an enjoyable introduction to reading stories in the English language. These stories are a combination of storytelling, folktales, myths and legends as well as non-fiction works—all a part of understanding the English language and the native English-speaking culture. Does SayABC Hire in Other Countries? Yes, they are beginning to expand to other countries, both to hire new teachers and to take their platform to other parts of the world. Originally, an emphasis was placed on teachers from the United States and students from China, but now teachers can be interacting with students from Japan, Singapore, South Korea, and parts of the Middle East. Also, teachers are now being hired within Canada and Australia. What Are the Educational Requirements to Work at SayABC? With a closer examination of these requirements, if you do NOT have at least a Bachelor's degree, but are an education major with a year or less to graduate, then you may also be considered as a fit for SayABC. What is Training Like at SayABC? Once you apply online, successfully go through the interview, and sign the consulting agreement, you will attend an orientation and evaluation class. Upon your acceptance, you will sign a 3-month contract, after which, contracts are renewed with the exception of the student teachers, who are hired for a less than three months at a time. The website was not clear as to whether or not training was paid, but it does look like there are incentives should you get through the entire application process and begin working. What is the Pay Like at SayABC? The pay is between $15 to $21 USD per a 40-minute class. Most teachers teach up to four classes a day and earn about $84 a day. Trial classes may also be taught with an added bonus of $8 per every student who decides to enroll in a regular class (equivalent to a sales conversion). Lessons are booked 24 hours in advance with protocols in place for substitute teaching when the scheduled teacher has to cancel. Preference is also given to teachers who can teach consecutively for nine straight days minus Saturdays and Sundays. What Are the Hours Like and How Flexible Are They? Classes are held in Beijing Time (GMT +8). If you want to see how the times convert to your time zone, Timebie is a free online conversion tool. Most teachers are given the freedom to set the majority of their schedule. What Are the Equipment Requirements to Work at SayABC? You must have a hard-wired computer or laptop with high-speed Internet and audio/video capabilities. You must also have a webcam and a headset with a microphone attached. Currently their platform only works with Google Chrome and does NOT work with mobile devices. What Do Others Say About SayABC? Glassdoor has given them a 4.4 out of 5 star rating on their reviews, if you'd like to read about what others have said about their experiences working at SayABC. How Can Interested Individuals Apply to SayABC? Go to their website and click on the apply button up at the top navigation bar. Good luck to all who pursue this opportunity.